Driving should be fun, and when you have 1.04 million kilometres of roadways to explore, it makes sense to drive the newly redesigned 2018 Hyundai Elantra GT to do it. The 5-door hatchback is exciting and functional, which is why they remain a popular staple on European roadways. Hyundai wants to share the entertainment, so they are expanding the GT’s reach to the Canadian roadways. The 2018 Hyundai Elantra GT is a compact car powered by a 2.0-litre inline four capable of 162 horses and 150 lb.-ft. of torque. Hyundai powered the GT Sport model with a 1.6-litre inline four turbo with 201 horsepower and 195 lb.-ft. of torque. You can pair the Sport with a six-speed manual transmission, which is standard in the car, or a seven-speed automatic with dual clutch. Either way, the ride is going to be exciting. You can count on a smooth ride and expect superb handling because Hyundai equipped the GT with a suspension to fit the model. The rear axle on the GT is built to meet your budget requirements while delivering a comfortable ride. On the other hand, the GT Sport is equipped with a sport multi-link setup in the rear, larger front brake rotors and 18-inch wheels for curve hugging precision turns. Hyundai calibrated the GT ride on the Nürburging race circuit in Germany, so they have a handle on their handling. It means that you can expect the GT to be solid and stable at high speeds, which is a comforting thought when you decide to take to the Canadian highways this summer. 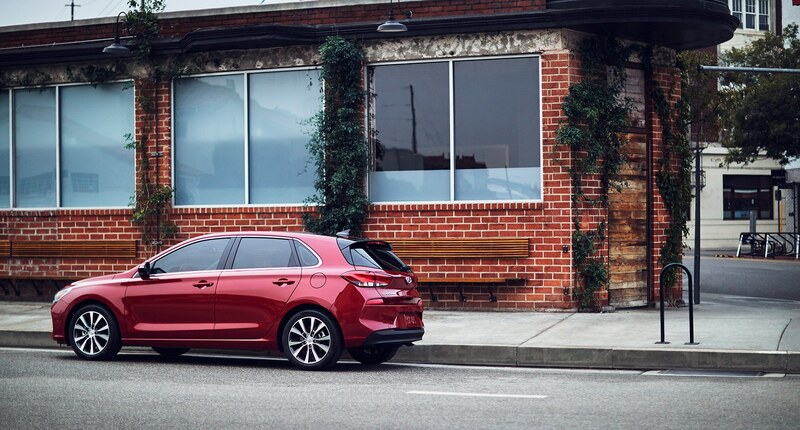 Safety is always a priority for Hyundai, so the Elantra GT has been built on the rigid composition SUPERSTRUCTURE™ frame that enhances safety. This stiff frame also gives engineers the ability to fine-tune the suspension in order to deliver the utmost in responsiveness. Behind the wheel, the first thing you might notice is that Hyundai took the infotainment centre and made it a stand-alone unit that is no longer part of the dash. They also increased the screen size from 7.0-inches to 8.0-inches. You need the extra room because Hyundai upgraded their navigation system to include current traffic data and maps. Another technology upgrade allows you to connect your Amazon Echo or Dot to the GT. You can have Alexa start the car, defrost the rear window, defrost the side mirrors and set the interior temperature before you even walk out your door. That is a definite plus on a cold morning. All you have to do is get in and drive. Of course, a heated steering wheel and front seats are standard in the GT. Since it is not always cold, the Elantra GT comes with a panoramic sunroof that lets you enjoy the summer sun as you roll along the highways. Slide it open and closed with a touch of your finger. The liftback gives you plenty of room for all of your extra cargo and dual-zone climate control ensures that you and your front seat passenger are both comfortable. Some of the safety equipment on the GT includes blind-spot detection, rear cross-traffic alert, lane keep assist and adaptive cruise control. The 2018 Hyundai Elantra GT is here just in time to help you enjoy your summer vacation or escape from school. If you want to see more of this vehicle and the bright colours that it comes in, then stop by and see us. We will even let you drive it. There are 1.04 Million kilometres up for exploration and a summer to drive them, so come by today.